Thrill seekers all over the world love water slides. They provide that all-important rush of adrenaline. In this list of the best water slides, we detail 20 over-the-top waterslides that are sure to impress. With everything from breakneck speeds to towering drop-offs to gravity-defying loops. 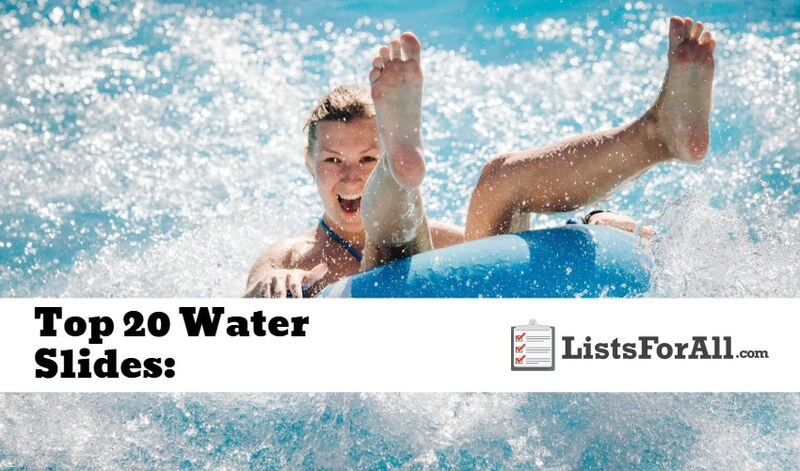 Each of the water slides on this list provides something special. Some of the water slides are even indoors. This means that no matter what time of year it is, you can still enjoy the fun of water slides. For a little adventure and a true adrenaline rush, check out this list of the best water slides! And, for even more fun, check out our list of the best amusement parks and our list of the best roller coasters. Wildebeest lasts an impressive two-and-a-half minute ride, which is one of the longest water slides in the world. A conveyor ride brings riders to the top of the slide. After that, a four-story drop propels the raft through a series of tunnels, hills, and around a helix. This water slide covers more than 2 acres! The Wildebeest is an impressive water slide that should not be missed. With a spa and a waterpark, the Sonnetherme in Austria has something for everyone. For those inclined to adventure, the Twister slide and the Speedy slide should not be missed. A lift takes riders up to the top of the Speedy, where a close to 500-foot descent is made at breakneck speed. The Twister, while a bit slower, is one of the longest indoor slides in Europe and is fun for the whole family. A fun and adventurous tandem water slide, the Jumeirah Sceirah propels riders at speeds of 50 mph. Riders make the journey from the 32-meter-high tower in capsules. Since the slides are tandem, friends and family can challenge each other to make the ride even more fun. With a 60 foot, nearly vertical drop, the Leap of Faith is aptly named. With a transparent tunnel submerged in a shark-filled lagoon, the word ‘faith’ takes on a whole new meaning. For a unique waterslide experience, the Leap of Faith is a no-brainer. At ten stories high, Scorpion’s Tail drops riders more than 50-feet a second. The vertical drop is a pure adrenaline rush. The loop provides something unexpected for thrill seekers as well. As America’s first nearly vertical waterslide loop, Scorpion’s Tail is not to be missed. This 85-foot tall slide is going to use gravity to propel you around a “near 360-degree loop before sliding you down onto a high-speed landing ramp.” While plummeting down the slide, riders can hit speeds up to 40 mph. Needless to say, this is one waterslide that is not for the faint of heart. The Master Blaster Water Coaster is a part water slide and a part water coaster. This gravity-defying ride is perfect for thrill seekers. With a variety of Master Blasters to choose from, each slide/coaster offers something different. Be sure to allow for plenty of time for these Master Blasters – you won’t be satisfied with just one ride! A popular Disney World attraction. The Summit Plummet is a free-fall water slide that begins 120 feet off the ground. The near-vertical drop brings sliders along a 360-foot flume where speeds of over 50 miles an hour are regularly recorded (speedometer included!). If you love free-fall slides, Summit Plummet is the slide for you! For a unique water slide experience, the AquaLoop is not to be missed. At the South Korea location, the AquaLoop drops from a height of 18 meters and then loops 360 degrees. This is going to ensure that thrills are had all around. For a once in a lifetime experience, the AquaLoop is not to be missed. Faser is a high-speed water slide designed for the thrill seeker. The Faser showcases German engineering and ingenuity. At almost 70 meters long and 19 meters high, slide goers can top speeds of almost 50 miles per an hour. Be prepared for one (or more!) awesome slide experience! This water slide is a group ride that is going to allow you to experience fun and thrills with friends and family. Sharp turns through the dark, speeds of 20 mph hour, and a drop into a giant funnel are all part of this slide. As you ride up the sides of the funnel and then drop back down, you will be able to experience a momentary Zero-G feeling. For group fun and big thrills, Big Thunder is an epic water slide. Boomerango is the longest water slide in Thailand. It is going to start you out at the top, send you barrelling down the slide, and then right up into an angled wall. When you hit the top of the wall, you will pause for a brief second (just long enough to let your heart catch in your throat). From here you will plummet back down the wall at 45 km an hour into a pool at the bottom. The Boomerango is a perfect mix of thrills, excitement, and water. Nothing says excitement quite like hurdling through a tube of water in near darkness. Now add in the fact that the tube twists and turns, and you have a whole new ball game. Caribbean Corkscrew is going to be perfect for the thrill seekers. The matching tubes will even allow you to race a friend. Whanau Way is going to be the perfect mix of excitement and enjoying the ride. It is great for both solo riders and partner riders. It has the thrill of a great water slide, but it isn’t going to leave you doubting your life choices at the top. If you ever find yourself in Orlando, make sure that you make time for Aquatica and Whanau Way. Similar to Big Thunder when it comes to the shape of the slide. Tornado 60 in Las Vegas is deserving of this list all on its own. Having won a variety of awards, this is one water slide that is sure to live up to the hype. Speed, a weightless feeling at times, and a giant cone slide all come together to make this an excellent water slide. Wavy and Vertical Fall are two different slides that are right next to each other. Vertical Fall is going to be a straight down descent that will rocket you down towards the pool at the bottom. Wavy is an up and down slide that will help take away some of the rocket-like speed that Vertical Fall offers. Both water slides are great though and well deserving to be on this list. Aquazoid will have you cheering and smiling the whole way down. This water slide comes with a variety of twists and turns and even some waterfalls. You will also be traveling at a lightning-fast speed of 20 feet per second. You will be able to experience all of this with your friends and family as well since each raft holds 4-5 people. Mayday Falls will have you feeling like you are traveling down a rushing river. Powerful water will propel you forward through the slides different twists and turns. The lush scenery on the banks of the slide will also help to give the rushing river feeling. This water slide is going to be thrills and excitement at every bend all the way down. Clearly marked “not for the faint of heart,” The Smoke that Thunders is a thrill seeker’s dream slide. With twists and turns in the dark, a funnel, and a giant wall, you will have all you can handle. The Smoke that Thunders is a must for ride fanatics. It will leave you wanting to get right back in line after each ride. You may not think of an indoor water slide being that impressive. As the name states though, this is one water slide inside or outside that deserves a spot on this list. The XXL Monster Ride is going to live up to every part of its name. This water slide has all the essential factors, speed, twists, turns, and a whole lot of water. There is just something about water slides that bring the child out in each of us. So whether you are looking to take your kids or are looking for yourself. This list of the best water slides is sure to have you wanting to make a couple of trips here shortly. There are a lot of excellent water slides out there. So if you feel like we have left any off that deserve a spot on this list, please comment them below and will check them out. Also, if you have been on any of these water slides, we would love to hear your feedback as well.